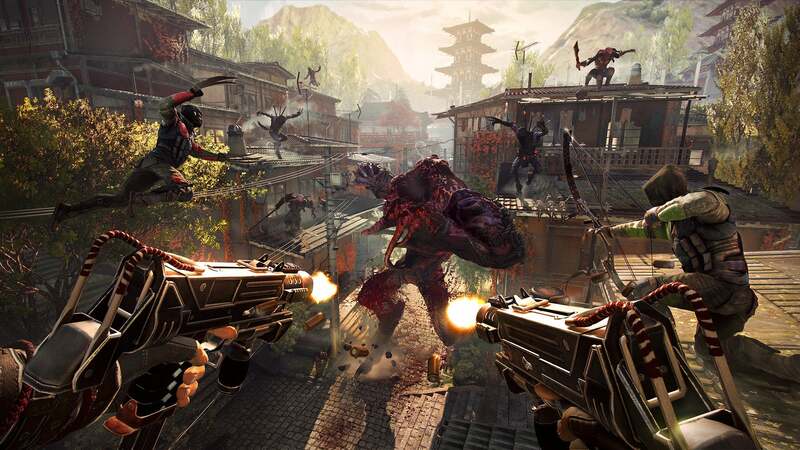 Every time I see a Shadow Warrior demo, I know there are going to be jokes of a, uh…phallic nature. I mean, the main character's last name is Wang, and the developers over at Flying Wild Hog are about as mature about it as you'd expect. Which is to say not mature at all. It doesn't matter. I still laughed. 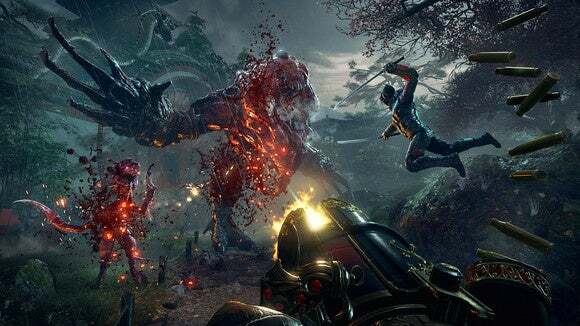 Shadow Warrior 2 looks badass. It's funny how quickly a series can turn around. Look at people's expectations for Tomb Raider, pre- and post-2013. Or Red Dead pre- and post-Redemption. When I walked into my demo for the original Shadow Warrior reboot two years ago, I honestly didn't know what to expect. The original is at best a B-tier classic, a tier below Doom and Wolfenstein and Duke Nukem. At best. But then the demo kicked off with Lo Wang singing along (poorly) to Stan Bush and I was hooked. 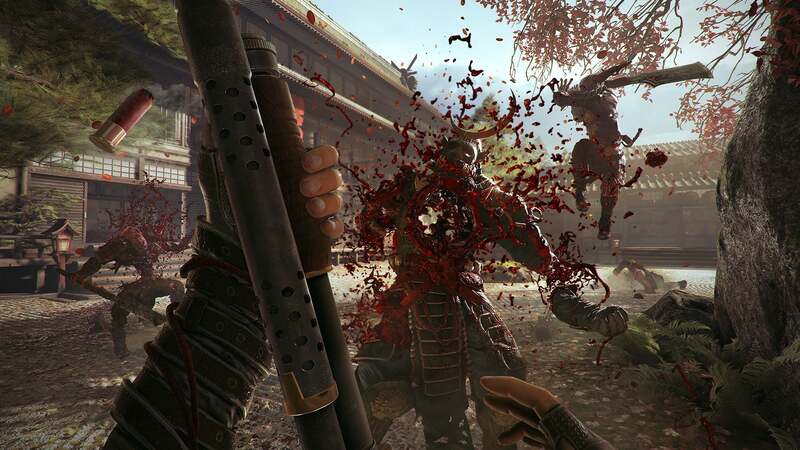 Enter E3 2015: Shadow Warrior 2 was one of my most-anticipated games. And while there wasn't any single moment quite as memorable as that singalong scene, I liked what I saw. You can either watch the E3 demo below or read on for my impressions. Like pretty much every single game at E3 2015, Shadow Warrior 2 is touting four-player co-op as one of its key features. The game is hosted by a single player, so when he or she leaves the level it forces everyone to move on. But—and this is a big but—everyone plays as Lo Wang. That doesn't mean you'll see four Lo Wang clones running around. Rather, each individual plays as Lo Wang client-side, but the other three characters show up as generic ninja-types. Thus you avoid the Halo problem where one person gets to play as Master Chief and the rest play as also-rans. Plus you get the full fury of Lo Wang's wittiest Wang jokes. One important question is how four-player co-op will handle the discovery of secret areas, loot, et cetera. All four players can split off and do their own thing, which potentially raises some interesting issues you wouldn't normally encounter in a more linear shooter. See, Shadow Warrior 2 is huge. That's really the biggest (no pun intended) takeaway from my demo. The previous game had moments where it opened up into relatively large combat arenas, but most of the game was a linear corridor shooter. Replete with invisible walls, for that matter. 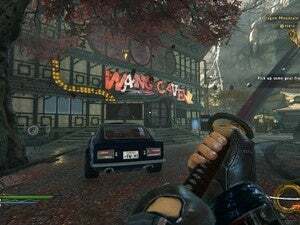 Shadow Warrior 2 doesn't go full open-world, thankfully. But it does open things up quite a bit, thanks to a more nimble Wang (heh) and a commitment to multiple approaches. Enter a residential area for instance and Wang has quite a few choices. He can sprint into the fray guns flashing/sword blazing, just like the first game. Or he can clamber onto the rooftops and avoid a few enemies. Or he can turn temporarily invisible and dash past entire armies of demons. I'm curious to see how balanced the stealth approach feels at release—during our E3 build it was a bit disconcerting to watch how easily the developers were able to cut out large portions of the level. It does make co-op more appealing, though. Four players in the original game's tiny corridors would've been a nightmare, but four players in levels geared towards exploration seems like a more reasonable proposition. All of the levels are also procedurally built. There are areas that will, of course, remain the same to accommodate boss fights and the like. Generally, though, a level will change each time you play it—and you might be playing them a lot, thanks to the new loot system. I'm less of a fan of the new loot system, but that's because I'm not a fan of loot systems in general. I'm worried we're entering Darksiders/Darksiders 2 territory—I much preferred the original's Zelda-esque approach to gadgets, whereas the sequel's loot-grind felt tedious by comparison. It's a personal bias: I tend to like when games mete out weapons in a logical manner, and Shadow Warrior was a perfect example of this—starting out with just a katana and a pistol, you eventually filled out the weapon wheel with everything from a four-barreled shotgun to a nuke launcher. And each weapon felt unique. 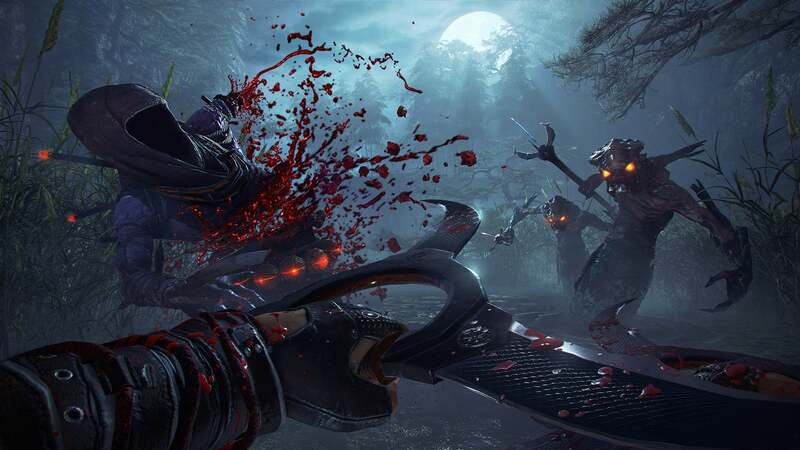 Shadow Warrior 2 boasts seventy weapons. It's not an inherently bad idea—I can't fault them for adding variety. I mainly wonder whether it's actual variety or mainly a bunch of weapons that look different but function the same way—e.g. when Flying Wild Hog shows off katanas, short swords, crescent blades, and hand claws does it feel different to play with those weapons or is it just an aesthetic choice? The upgrade path for weapons is also more fluid, with three gem slots per weapon. 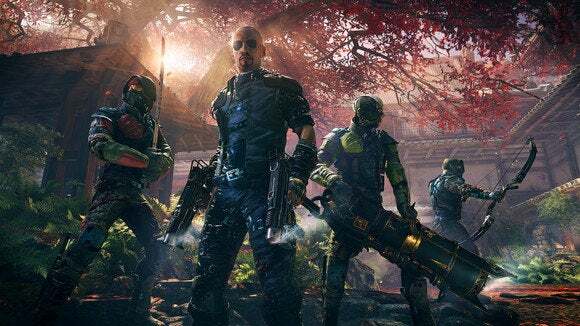 Again, I wonder if it'll have the same uniqueness I loved about the original Shadow Warrior's arsenal—every weapon in that game had a reason to push for the last upgrade, which isn't really a feature of loot-driven games. And then there's the question of re-running levels. I…don't play games that way. I just don't. I don't like running levels. I don't like loot-grinding. If you're into that, great. However, I'm hoping it feels just as valid to simply play through the game start-to-finish if I want, without feeling like my gear is underpowered. Unfortunately I can't really know the answer to any of those questions without getting my hands on the game or—better yet—playing through it start to finish. It's going to be a bit of wait, with Devolver aiming this at an early 2016 release. That's probably a smart call since the last game got lost somewhere in the fall release rush. I'm excited, though. Shadow Warrior blew past all my expectations with both the quality of its action and its Big Trouble in Little China -esque plot. It's safe to say I'd take another serving of Wang.